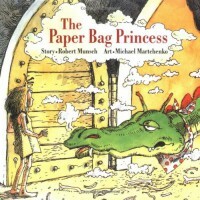 This precious book is about a princess named Elizabeth. This is a change from ordinary fairy tales because Princess Elizabeth has to save Prince Ronald instead of the other way around. The Lexile level is AD740L. I would use this in a 2nd grade classroom when I would be teaching about summarizing stories. I would read the book to the class and then give them each a paper bag. They would be instructed to decorate their paper bag as a princess or a prince. They will be given a flash card to put as the stomach of their paper bag royalty and they will put their summary of the story on this flash card!